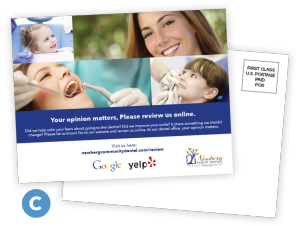 Social Proof; your business needs great online reviews. Period. The only question is how to get them. The problem is that an unhappy customer will go out of their way to give you a bad review. It happens to every business occasionally. On the other hand, your best customers may not always be motivated to give you five stars and a great testimonial; getting satisfied customers to review you takes some amount of effort. There is no magic bullet. But you can do it … by working the right plan. Things change quickly on the Internet. The reviews site that mattered 12 months ago may not matter today. 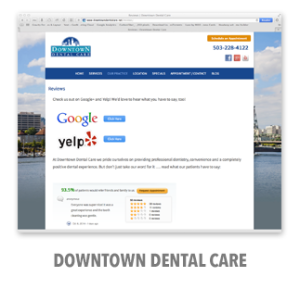 We know the reviews pages that matter today are Google+ and Yelp. But in another 12 months that will probably change. 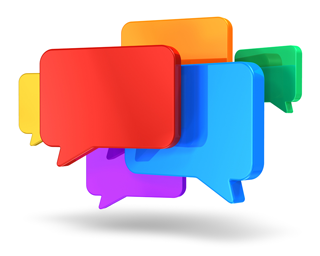 So why not just create your own reviews page, where you can display your very best customer testimonials and control your online reputation? 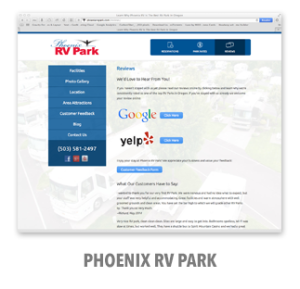 You can also decide which reviews sites you want to link to as the times change. Don’t rely on Facebook, Google, Yelp or any other service may cost you a lot at some point in the future … What if you had staked your online reputation on MySpace in 2003? Facebook may or may not be relevant in another 3-5 years. Google could become the next Yahoo! Yelp may become irrelevant. Where will any of those potential events leave you? By creating a great reviews page on your own website you own your own online reputation! 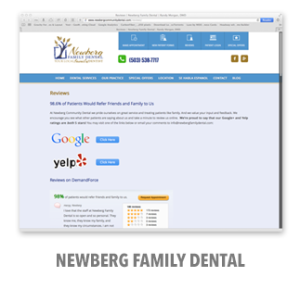 You can update it anytime you like and continually display the best reviews your customers have to offer. Then ask your best customers to review you. Ask them in person and many will make the commitment with every intention of following through. Unfortunately, most of them will forget … unless you remind them. 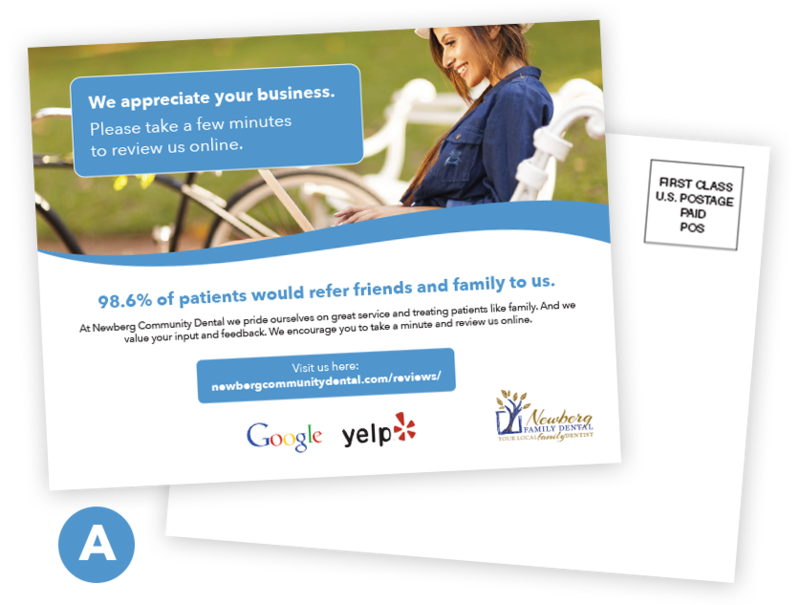 Both of the studies listed below show that you it makes sense to try sending them a postcard with your handwritten note on the back. They may feel just enough sense of duty to follow through on their verbal promise. We’re all busy, so a quick reminder just makes sense to try, right? If they still don’t review you, ask them again the next time you see them. Remember; countless marketing studies show that it can take up to 7 touches before a customer remembers and trusts you enough to take the desired action. 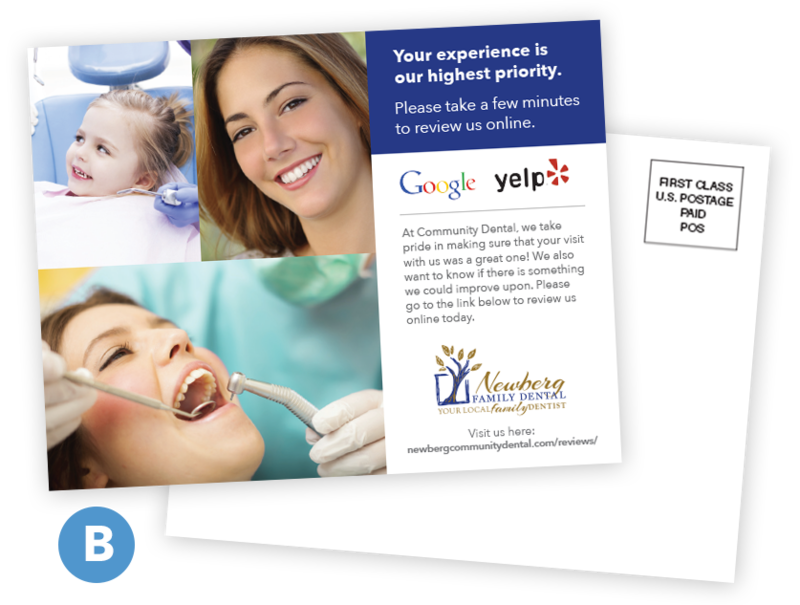 As the study above shows – A Review Handout Alternative: Try P&P To Get More Local Reviews, your best bet may be to ask in person first and then send a simple reminder postcard to your best customers or patients after they’ve recently visited you and had a positive experience. 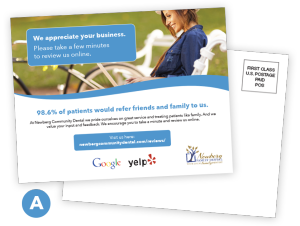 We’ve made it simple and cost-effective for you to get these postcards; prices start at just $86. 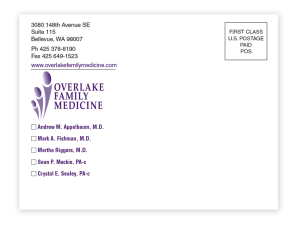 Keep in mind this is not just another spray-and-pray, direct mail pitch; you only want to send this message individually and personally to customers or patients who’ve already verbally agreed to review your business. It’ easy to get started; just pick a template and place your order using the sign up form below! 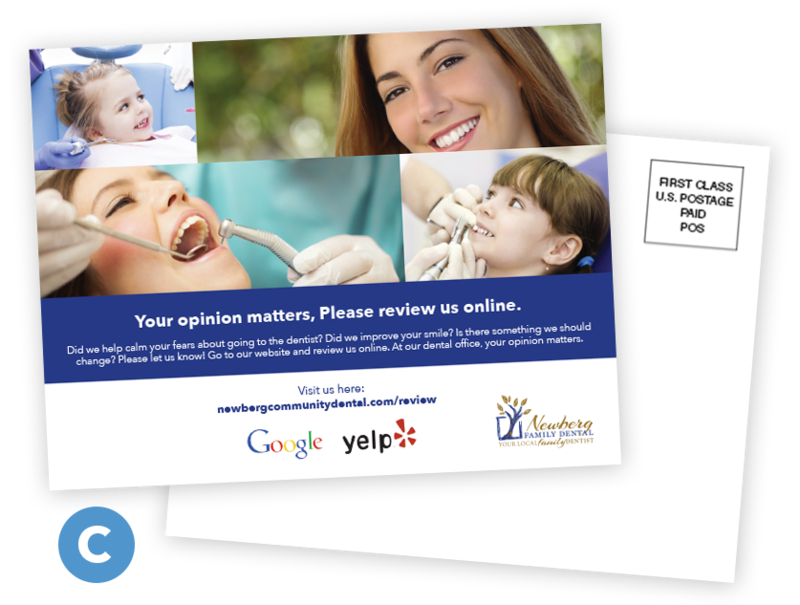 To sign up for our simple, cost-effective local reviews postcard program simply complete the form below and within 1 business day our representative will respond to answer any questions you may have and to confirm your order. Orders generally take 10 business days to produce and ship. Custom orders may take longer. 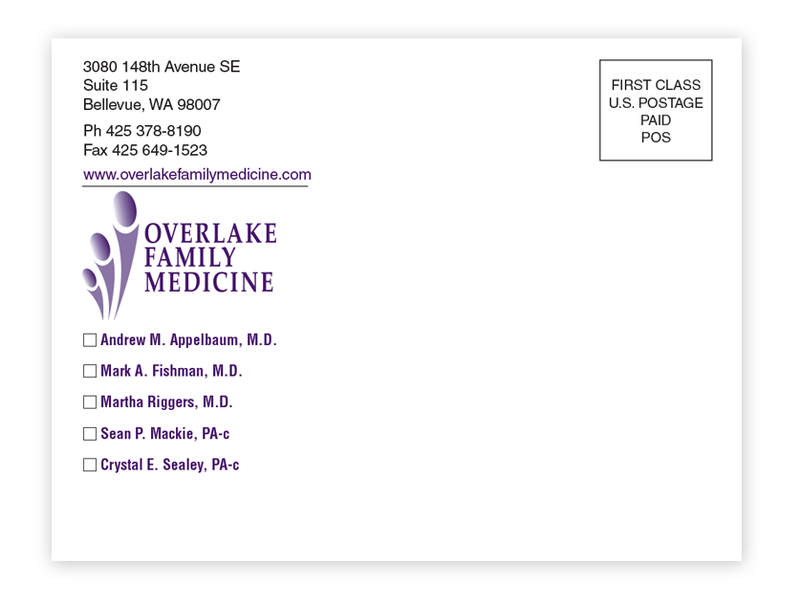 Please note: Custom design is billed separately from printing and typically takes 2-3 hours at a cost of $150-$200. I understand this will add production time to my order delivery date. Accepted file types: png, eps, jpg, gif, pdf. 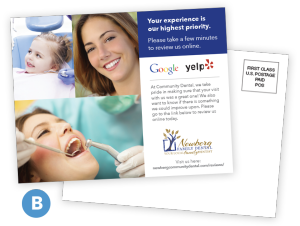 We prefer you upload a PDF or EPS, but a large JPEG, GIF, or PNG will work.